Welcome from the Subcommittee for Africa and Global Health. Chairman Payne is the chairman for the subcommittee and excited about the hearing and personally couldn't make it but is actively involved on this issue as the chair. Congressman Payne and Congressman Bozzman are co-chairs on the malaria and NTD Caucus and so we're really looking forward to this briefing and so happy that we're all here. After we hear from the speakers we'll open it up for questions. Hi and thanks, and thanks again and thank you to the caucus for sponsoring and making this possible. I'm not going to talk very long. There are experts for that. I just wanted to give a big picture for neglected tropical diseases and there are neglected diseases like HIV/AIDS, TB, and malaria that are neglected diseases, but then there is this group of WHO-designated 14 neglected tropical diseases that affect over a billion people, people living in rural, very poverty-stricken areas often, and in most cases really neglected within their own health care system and very difficult to access. And the US has had a program in this area for the last five years. Mary Linehan from RTI will talk about that. There are still significant needs and Francois Chappuis from Doctors Without Borders will speak to the additional needs and the ability to expand this program, this successful program, beyond the seven of those that the US government is currently focused on. And Dr. Manica Balasegaram will speak to the new tools, the new drugs, diagnostics, new vaccines that could really be the game-changers for controlling and eventually eliminating these diseases, so I think we will just get started. I just wanted to give a bit of an overview and am thinking that these NTDs - even their names we've probably never heard of before - they significantly disable or kill a huge number of people in the developing world. So I'll go to Mary. Thank you. So I'm Mary Linehan. I'm the Operations Director for the USAID-funded NTD Control Program which is implemented by RTI International and as Jana said there are a group of about 14 designated by the WHO NGDs and among those there are seven that we consider tool-ready and they are: lymphatic filariasis or elephantiasis; onchocerciasis, which is river blindness; schistosomiasis, or snail fever; trachoma, which is a blinding eye infection; and three soil-transmitted helminthiasis, which are whip worm, hook worm, and round worm. Now what we mean by tool-ready is that there are current diagnostic and treatment tools that are sufficient to target these diseases either for elimination or control. And by control we mean reduction to the point where they are below a public health threat. The US Government has worked with WHO and other global stakeholders for NTDs to develop some strategic approaches to control these diseases. We actually talk about them as five and group the soil-transmitted helminthiasis as one, and the treatments are called preventive chemotherapy and this involves single doses of effective treatments that are given usually once a year to very high portions of the population through what we call mass drug administration or MDA. Now most of these drugs used in a single dose with yearly treatment regimens are available through public/private partnerships. They are almost always donated through a couple of important drug companies, including Glaxo Smith Kline, Johnson and Johnson, Merck and Co., Pfizer, and the US government intended primarily to leverage all these donated drugs to make these safe and effective treatments available to what is approximately 1.2 billion people who are at risk to these diseases. So in 2006, Congress authorized funds for integrated control of NTDs and this led to authorization of USAID and the NTD control program, which is what I work for. It was envisioned that it would work in about 15 countries over five years with a ceiling of about 100 million dollars. That was the original amount of money that was put forward as being appropriate to address this strategy. So the targets for the program, which were what the government initiated in 2006, were to treat 40 million people, to administer approximately 160 million drug treatments in about 15 countries. And RTI was a prime contractor and we work with a range of partners, mostly international NGOs who then we support governments to implement the mass drug administration, depending on the co-endemic disease burden in the country. So the country supports government national level programs to scale up their integrated control activities and to build national level programs so that they might, in fact, achieve coverage rates which would allow disease elimination. But there are a couple of important guiding principles. One of them is that we build on what was already in place. In many of the countries that we work in there are already disease-specific programs for LF, shisto or de-worming programs and USAID and the global community agreed in general that if you could integrate these programs, get them to work together, they could share resources and perhaps become more cost-effective, use these limited resources to scale up to the national level and treat more of the targeted population. So we have to use integrated approaches and we do it to assure that there are cost-effective treatments, not just to integrate for the sake of it, but literally to use these funds better. We also work very, very hard to ensure that there's government ownership and leadership of the programs, that we're not, in fact, doing it for them. So in the first year we started in Ghana, Mali, Niger, Burkina Faso, and Uganda, and they were selected because they had existing, established disease-specific programs. Some of them were not getting very good coverage, some of them were not too clear on what their prevalence rates were, but we started out with the idea that they had something to build on. In the second year we were asked to scale up very quickly and we included Sierra Leone, Southern Sudan, Haiti, Nepal, and Bangladesh. So we went very quickly from five countries to ten and then in year three we added Cameroon and Togo. And, again, just as a point of reference, we are now about three-and–a-half years through our program and I'm going to be presenting the results of our first three years. So our implementing partners, these are absolutely critical partners, RTI, as I said, is the prime on this project but we work closely with a range of important stakeholders and NTDs: Liverpool Association on Tropical Health, Health and Development International, Helen Keller International, IMA World Health, the Malaria Consortium, the Schistosomiasis Control Initiative at Imperial College in London, and World Vision. Now despite the fact that this is a five-year program with a 100 million dollar ceiling, funding levels from Congress were never that high. They were, in fact, level at about 15 million USAID for NTD control for the first three years and our program received a portion of those funds which were approximately 13 million a year. So we also had a mandate that we needed to assure that of the 13 million every year, we spent 80 percent of it on direct program implementation either through the grantees or directly in some of the countries where we operated. And that was to ensure that no more than 20 percent of the total of any of the amount of the funds we got never went to our own management cost. So this was actually a very successful program. We're very happy to say the results of the program. First of all, we made a very significant contribution to the evidence base for the distribution and the intensity of the disease that's in the country in which we work primarily for shisto, trachoma, and LF because for the most part, we know where the soil-transmitted helminthiasis are, they're everywhere and elephantiasis is a disease that had been well mapped and well documented for many, many years partly because of USAID’s very, very strong support. So in addition to the mapping we were asked to track how much toward national scale and how many more people we could track every year, and in year one we used as the base line the number of people the countries we were already treating before we came in and we tracked the number that we treated in addition. The first year we treated an additional 16 million people with 36 million treatments. In year two we targeted 27 million people with 58 million treatments, and in year three we treated 55 million people with 127 million treatments. So you can see that at the end of year three we have fully exceeded the program targets for the entire five years. The benefit of this is that we have given USAID good evidence that their strategy worked, that integration, in fact, can be a very cost effective, very effective way of scaling up to national scale, but also demonstrating that these countries can absolutely do this themselves with the proper technical assistance and resource allocation. So our cumulative treatments to this point are nearly 100 million people over three years, which have been reached with over 220 million treatments. The value of the drugs that we have used from these donated sources is on the order of 575 million dollars a year. That's what we used in year three. So for all three years the total value is about 1.4 billion dollars. These, again, are very, very important critical donations from the private sector; these companies are absolutely committed to the control and elimination of these diseases and have made these drugs widely available and USAID’s commitment and additional resources have allowed these drugs to get out to people and start to address the problem. One of the key strategy elements is that you must get high rates of coverage in every country at the national scale consistently over the years in order to break the cycle of transmission for some of these diseases, and because the science is not entirely certain of what the level of coverage is, we've aimed very high. Many of the disease programs suggest that about 70 to 75 percent coverage rate be adequate, but we've gotten 80 percent coverage and the country programs and our grantees should be credited with the extraordinarily high achievement. In the course of the first three years we've trained over 220,000 government workers and community drug distributors which has significantly increased the capacity of countries to not only implement mass drug administration, but to plan and budget and document and monitor and report on their results. It's been quite an extraordinary three years. We've gone into countries where there were no existing structures and have now seen some of them go from very, very small programs to national scale within a year or so. The programs’ expenditures are also tracked because the level of funding was consistent and below what was anticipated. We actually received in those three years not 60 percent of the allocation, but only 40 million of the 100 million dollars. So at the end of year three we'd spent about 38 million dollars of that funding and I'm happy to say that over 81 percent of that was expended in the countries, so we were able to assure that less than 20 percent went to management costs, which I think, again, really speaks to USAID's commitment to assuring that the funding gets to the field, gets to the countries, and really does its job. What I also want to highlight is that these numbers don't clearly, don't give enough credit to the extraordinary importance to these donated drugs. If the drugs weren't available, this program would not have been successful. And so we really need to acknowledge the important contribution of GSK, J and J, Merck and Pfizer, but they also cannot do their job unless these funds are available. It has been an extraordinary public/private partnership, perhaps one of the biggest in the world and it has been very, very successful. We work closely. We work very productively and continue to expand and scale up our targets every year. The other thing I’d like to highlight is the importance of the partnerships. The Ministries of Health in every country we work in absolutely take the lead in these programs. They are responsible for insuring that the implementation takes place. We have global partners all over the world, public health implementers, public and private sector donors, and pharmaceutical companies that make this global effort work and the potential for really eliminating these diseases. So while the drug manufacturers themselves have provided the majority of the drugs, there are also some generic drugs that USAID is an important procurer of. We don't have a donation program but...the one disease that the drug is not widely available through donation is for schistosomiasis. USAID's funding has been used to assure that those drugs are also available. There are also a number of other groups that have provided really critical donations and among them are: The Medical Research Unit, Medical Research Council, UNICEF, University of Notre Dame, WHO, World Food Program, IMA World Health, and World Vision. All of these contributed smaller amounts but absolutely critical elements of the donation program to make sure these drugs are available. So as we go forward....we've met our targets and our programs. We continue to be able to scale up. Our country programs are really starting to show some important success and also to document some of the challenges we face, and some of the things that didn't work very well. I think this will be very important as we go forward. And I'd like to highlight one of the things that we continue to encounter, and that is at USAID, a mandate to us is to make sure that we work within the national government's strategy for NTDs. We can only focus on five of them and what we have been finding in many countries is that their own portfolios are a little more diverse, and a little bit more expansive beyond mass drug administration and sometimes diseases which USAID cannot fund. It's very important that we continue to find other donors. It's also important that we recognize that if this is going to be a true partnership, the national programs and their needs are going to have to continue to be an important voice at the table. Thank you. Thanks very much, Mary. Now we'll move to Dr. Francois Chappuis and I didn't mention that their bios are on the back of the agenda and hopefully were picked up out front, so I'm not going to go into great detail, but Dr. Chappuis has worked with Doctors Without Borders for over ten years. He's an expert in implementation of tropical disease programs for Doctors Without Borders. Thank you very much. I hope you will be tolerant of my French accent. Yes, the group; I think Mary showed that it's possible to act efficiently on these. The group is larger than the seven diseases that are covered by the present program, some 13 to 14 diseases. 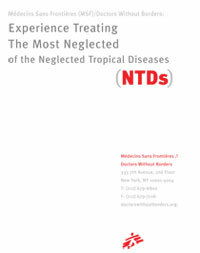 Among them is a sub-group called most neglected tropical diseases. They have some characteristics and they have been almost completely deprived of any significant funding for national programs to tackle these diseases. They are rapidly focalized in some countries and within countries in certain areas, usually remote, rural areas. They are classified by WHO as tool deficient diseases, something that as you can see, is quite a discussable way to call it. So let me introduce you to these four diseases. Some of you know them, but the first one is sleeping sickness. Imagine yourself: you are in the northeast of Democratic Republic of Congo, a very remote rural area. This man has been suffering from a fever for quite a few weeks now. He is also complaining of a headache. He is not feeling well and he is not able to walk anymore, so his wife, who has to take charge of the children, also has to take charge of their activities. Finally, his neighbor says that there is an organization that has a treatment center for this disease about 50 kilometers away. So he managed to be carried, and this is not an invention, on the back of a bicycle, to this treatment center, and happily, someone was there to apply a diagnostic test to do a lumbar puncture to see that, indeed, the disease was advanced. Ten years ago, this patient would have received an arsenic-based treatment called melarsoprol that had a chance of killing the patient in about five or ten percent of cases. But now there is a new treatment that is an association of eflornithine that is given intravenously twice a day for seven days and an oral treatment called nifurtimox. This new treatment will not only save his life, but will prevent any further relapse. This is a case study of sleeping sickness. Sleeping sickness, why? Because this patient falls asleep during daytime and can’t sleep at nighttime. It gave the name to the disease. If you don’t treat it immediately, it leads to a coma that leads to death. It’s always fatal. Kala azar is another one of these diseases. Now, you are in the northeast of India in a province called Bihar. It is the poorest province of India. This is a disease, by the way, that is also present in Nepal and Bangladesh. Also, it presents itself with a long-standing fever. First, the patient thinks that they may have malaria and they treat themselves for malaria with no response. Then they discuss within the family that they will sell, perhaps, some of the items, some of the cattle to finance the trip to the nearest town where they may get diagnosed with kala azar. It is a parasite that is transmitted by a small sand fly. If you get the disease, there is also the same outcome. You will die if you don’t get treatment. In the past, it was very difficult to get diagnosed. You had to go to a referral center and get your bone marrow punctured or even your spleen punctured. Now you have a point of care test: a drop of blood from the tip of your finger, you collect it, you put it on a dipstick, and in 15 minutes you have a very reliable result, positive or negative. And now for treatment, you have a panel of possibilities of treatment, especially in this area of south Asia. Thanks to many studies that have been conducted during the last years, even a single dose of a drug called AmBisome will cure 95 percent of cases. But you also have an association, a short duration association, of drugs, relatively cheap that will cure you. This disease is also very much present in east Africa, in Kenya, in Uganda, Sudan, and Ethiopia. These are the two hotspots for this disease. Then you have chagas disease. It’s American Trypanosomiasis. So now we are traveling to South and Central America. You catch this disease by getting bitten while you are sleeping by a bug that is called triatome that actually falls on you during night time. It’s a kissing bug; you don’t feel it. It bites you, the bug defecates, and the parasite goes through the skin and infects your blood. If you don’t treat it, it may, in one third of cases, infect your heart and your digestive system, which is fatal in 50 percent of cases. It’s a very latent, very long-lasting disease, but it is still very frequent in many areas of Latin America, especially in some countries like Rhodesia, for example. It is also a disease that is very frequent in Latin American migrants. It is estimated, for example, that in the US, there may be 300,000 infected with chagas disease. You can also get the disease vertically, for example, from a pregnant woman to the newborn, or even orally from some fruit juice that you might have consumed unpasteurized. The last one, less known than the others, is Buruli ulcer. Buruli is a district of Uganda where the disease was discovered. It mainly affects children, especially in West Africa. The child goes and plays in the swamps or in the river. We don’t exactly know how the disease is transmitted, but a few weeks later the child will have a kind of a bump on his skin. It’s painless. And following this bump, there will be a hole, and then there will be a big ulcer. Sometimes it covers the whole limb, and it’s due to bacteria, micro-bacteria, like tuberculosis, which is in the same family of bacteria. In the past, there was no real option other than trying to find a means to go to the capital or to get operated, surgery. Now we know treatment with antibiotics given for two months is sufficient in most cases, especially early cases. Sometimes surgery is needed in the remaining cases. Wound care is also crucial, as it is for other diseases that are prevalent in these areas, like leprosy. So this group of diseases shows that the picture has changed over the last years. Tool deficient is a term that we don’t like very much. I think what we should call them is a group of tool improvable diseases. Indeed, the tools can be improved, and that will much facilitate their integration into any program of control and elimination. But in the meantime, we cannot just stand still. The past has proven that these diseases can be controlled, even when we thought that sleeping sickness in the early 60s was almost eliminated. Visceral leishmaniasis, during the malaria eradication in south Asia in the 1960s, was almost eliminated for at least ten or 15 years. Chagas disease in many South American countries has been basically eliminated as a public health problem. So it is feasible even with the tools we had 50 years ago, and now with the better tools we have, it’s very much feasible that we experience with MSF programs during all these years. There is clearly a need for an integrated approach when you have this example I told you about, the febrile malnourished woman in northwest Ethiopia. Of course, this patient might have malaria, a repeated attack of malaria, or may be tested for HIV, may be positive, then may be receiving HIV anti-retroviral therapy, but not responding. Why? Because this woman has ongoing visceral leishmaniasis. So this group of neglected tropical diseases has to be taken as a whole because this woman may have been infected by worms that may have contributed to malnutrition. And another thing is that these diseases, it has been shown by health economists, are cost effective to tackle and to treat. The cost effectiveness to treat a case of kala azar or a case of sleeping sickness, for example, is very much comparable to the cost effectiveness of treating a case of worms. Why? Because it is a deadly disease. Even though the diagnosis and treatment is a bit more complicated, as it is a deadly disease, the impact is more visible. So in conclusion, not including this group of most neglected tropical diseases, would mean that we are not giving a response to the needs of the most vulnerable people on this planet, and certainly among the most voiceless at both international and national levels. And I think that the Global Health Initiative is just a unique opportunity to tackle diseases effectively. Thank you for coming here today and giving us the opportunity to speak. I think I’d like to start by giving a story of my experience working in east Africa, and trying to put into context, I think, why these neglected diseases are important, and why R&D is also an important component in this. About eight years ago, I was working in the Sudan-Ethiopia border and at that time there was a big outbreak of visceral leishmaniasis, a disease also known as kala azar. I was sent to work in a very rural hospital that was about four or five hours drive from the nearest town. When I arrived there, there were about 600 patients in this rural hospital. I was the only doctor, and the only foreigner in this area. Out of those 600 patients, probably about 500 had kala azar, or visceral leishmaniasis. One of the patients that I actually saw that day, I worked there for a period of six or nine months during this epidemic, and one of the patients that I saw was a woman who had brought her young child in. She had to come a very long distance. This is exactly the kind of story that Francois had mentioned. She had taken many days to come to the health center. It was the only place where treatment was being offered in a very large geographical area. She had to stay in the hospital for over one month because at that time the only treatment that we were giving was a drug called sodium stibogluconate, which is a fairly toxic treatment. About five percent of patients would die during the treatment course. But the big problem was also that it took one month to treat the patient, to treat the child and to discharge. But that was fine. It went well, and I was quite happy with myself. About a month later she came back, this time with another child. This time the child didn’t have kala azar. The child was severely malnourished and had a whole host of other problems, including some of the problems that Mary mentioned, some of the neglected diseases that Mary mentioned. We had to treat this child. We had to look after the child. We had to basically provide the therapeutic feeding that the child needed. In fact, I also found out that in the time that she had come in during the previous admission and during the time that we were treating her child for kala azar, two of her other children got sick. One of them died at home. Her second child she brought in when she came back and realized that this child was also sick. So somehow I felt that we had really utterly failed this lady. We had offered the treatment to one child and inadvertently two other children became sick. Of course, the reasons are fairly obvious. This is a neglected issue. Patients have to come a very long way to seek medical care, and there are huge consequences to making that decision to seek medical care for that one child that had very negative consequences for her other two children. But she is really in a no-win situation at this point. I think this is exactly the reason why all these neglected diseases need to be tackled. The real hallmark of them is that they are really the diseases of the bottom billion, the people at the bottom of the barrel, living in the most rural places with a very poor healthcare structure or healthcare services available. That’s for me the common feature of all these diseases, rather than getting technical and looking at what is the cause of this disease, and what is the parasite, and all of this. It’s really for me a disease of extreme poverty and really the situation that all these people live in. And this is why to me, all these diseases have something in common, and this is why all these diseases should really be put together and tackled in an integrated approach. But I think going back to the R&D. Clearly for me there were a lot of things that needed to be done to better improve this outcome. I actually started doing a lot more work in research and development for neglected diseases. I think over the last few years, we have definitely developed a lot of better treatments for some of these most tool deficient diseases, as Francois said, which is one of the terms that have been used. But I think as Francois mentioned, this is not a really good term because I think a lot of change has happened. I think the organization I work with and many other organizations working in the field of research have helped to develop better tools. Francois mentioned some of them. Sometimes this has basically been to combine combinations of drugs – two drugs that don’t work very well by themselves or because of a variety of problems, very long treatment courses, they are toxic, or whatever, they can be combined into very short course treatments. So that’s some of the research that’s been done. On the other hand, there’s also some research into completely new tools. One of the clinical research projects that we are currently working on is a drug called fexinidazole for sleeping sickness. This is now started phase one. Drugs for Neglected Diseases is working with Snaofi Aventis to develop this drug and we hope within the next few years this will eventually be a tool that can be ready to use at peripheral healthcare centers. This is not going to involve injections or long treatment courses, but will be a very short-course oral treatment, and that really is a game changer. So for me, I think there really is some hope. I think there really is a lot of active research going on. There is a lot of research that has been done and I really think we are at a point where we can offer something better to patients. Even where, in cases like chagas disease where the treatment is very long, there are new projects coming along to actually look at better treatments that, OK, might take a little while to come, to be delivered to patients, but these things are definitely on the table. What we really need to do now is put all these diseases on the agenda, keep them on the agenda. I’d like to say that for me the GHI is something that offers a lot of hope. When I was working in this center in 2002, I would never have imagined being here, talking about these diseases, and actually being in a situation where you can think that a lot of money is being put on the table, and there is actually hope for people who are really the bottom billion, the people who are really at the bottom of the barrel – that their needs, and their issues and their healthcare concerns can be addressed. This is really, really important. It’s sad for me that some of these diseases are diseases that you may never have really heard of, but the good news is that there are very active steps being taken, there are proposals being put in place. I think these actions really can have a huge amount of impact for the patients. For me, really there are two particular points that Francois mentioned. First all of these NTD’s, we put them together. They are all neglected diseases and they are all diseases of neglected populations. So we should be looking at them and we should be looking at integrated ways of managing them and making them relevant to the populations, rather than just to the disease itself. The second thing I would say, of course, going back to R&D. R&D is important because, ultimately, in the long term we want to be able to insure that these tools are always there. For a variety of reasons, sometimes we know that, whether it’s antibiotics, or anti-parasitic drugs, anti-retrovirals, or whatever, resistance will eventually develop to some of these drugs, so it’s important that we do keep alive an R&D agenda. That is the same for NTD’s that are tool-ready, for instance, but also, as I say, to develop better tools and this is an ongoing process, and I think that for me, R&D is very much a part of the issue of control. Any control program for me has an element of doing surveillance, doing diagnosis, doing treatment, doing prevention, but I think that fifth pillar is definitely doing research and development. I think they did such a good job, there’s really not much for me to say. Probably we’ll open for questions. I think the US program is good, it’s successful, and it’s a great start. The RTI has done an amazing job. I think that Francois and then Manica showed that there is room for expansion, that we can use that success and leverage it, and really talk about control and eventual elimination in certain populations for all neglected tropical diseases, because it is possible. Thank you all. We have about 20 minutes for those of you who have questions. We would love to open it up and have a discussion. So does anyone have a question? Q: The diseases that aren’t being treated, is the reason they aren’t being addressed because there isn’t any in-country program? Why did USAID pick the diseases that they picked? A: Mary Linehand (RTI) - The simple answer is that USAID’s funding was built on the existence of these donation programs. The donation programs exist because these drugs are available and effective and safe and easy to give out, and there is an annual treatment schedule that allows them to be really cost-effectively given out. The other thing is that the diseases are co-endemic, so you could really give out a package of drugs and treat more than one disease. So, for example, ivermectin which is used to treat onchocerciasis, if combined with albendizol, also treats LF. If you’re treating your entire population with albendizol, you’re also treating for worms, so with those two drugs you can treat three diseases. And they’re often co-endemic, so it makes an awful lot of sense to build on that donation program and use these additional resources and scale them up. Now they selected these diseases because of the donation programs, and also because there was no established model for how you would do this. This was very much a new idea. USAID was really a global leader in establishing these integrated scale-up programs. Three years later we can point to how successful it was, but three years ago there was really some doubt about if this would be cost effective, and indeed, there was a lot more money made available because there was some doubt that it would be as effective as it is. I think we are finding ourselves in the remarkable position of having achieved more than we even anticipated, that anyone anticipated, and that gives us some flexibility to think about what else we can do. The US government continues to be committed to this, which I think again continues to leverage other donors. I think we are at a different stage than we were three years ago, and their rationale going forward may be a little bit different. The first five were selected because of cheap, effective, donated, largely drugs. A: Dr. Manica Balasegaram - One thing that I might add is that one of the new treatments that has just recently been developed for sleeping sickness, which is a combination of eflornithine and nifurtimox that Francois mentioned, actually, both drugs are available through donation, and they have been made available by Sanofi Aventis and Bayer for more than five years now, and that donation program has been renewed as well. These drugs are donated for WHO and WHO will provide these drugs to any country that places an order. Where the weakness is, is actually at country level, at the Ministry of Health level, where there actually are inadequate resources to mobilize a good control program, to do surveillance, case detection, and treatment. So I think, just to build on what Mary’s saying, I think that Mary’s really demonstrated that in tackling these NTD’s you can achieve huge amount of success, and for diseases like sleeping sickness and visceral leishmaniasis, these diseases are uniformly fatal. Every patient who is not treated will die. That is a big deal. We know that for leishmaniasis, it will range between $70 and $150 depending on what treatment you use, and that includes not just the drug price, but the hospital costs and the patient costs; that will basically save a life. And for me, that is a big impact. Mary Linehan is a senior international health specialist in the International Development Group and operations director of the Neglected Tropical Disease Control Program. Ms. Linehan has more than 18 years of international work experience in program management; technical assistance to ministries of health; and research for maternal, infant, and child health and nutrition. Special areas of expertise include program development and management, training, infectious disease surveillance and field research, malaria and neglected tropical diseases, and local capacity development. Ms. Linehan was instrumental in the design, implementation, and early success of the Nepal National Vitamin A Program. She has extensive Asia regional experience, including 12 years of residence in Nepal, Indonesia, the Philippines, Thailand, and Vietnam. She has a masters degree in public health specializing in International Health from Columbia University School of Public Health; she has also earned an MA in Asian Studies from Columbia University School of International and Public Affairs. Ms. Linehan earned her bachelors in History from Georgetown University. Dr. François Chappuis is a physician specializing in internal and tropical medicine. He completed a masters degree in Clinical Tropical Medicine at Mahidol University, Bangkok and a PhD in Medical Sciences at the University of Antwerp, Belgium. He is currently Associate Professor at the Division of International and Humanitarian Medicine at the Geneva University Hospitals. Dr. Chappuis has worked for Doctors Without Borders/Médecins Sans Frontières (MSF) since 1996, initially as a field doctor in Kenya and Somalia, and then as a medical adviser for leishmaniasis and African trypanosomiasis in Sudan, Uganda, Kenya, and the Democratic Republic of Congo. His clinical research activities focus on African and American trypanosomiasis, leishmaniasis and snake bites. Dr. Balasegaram manages DNDi’s clinical research projects for the treatment of visceral leishmaniasis in East Africa. Prior to joining DNDi in January 2008, he was Head of the Manson Unit, a medical research and implementation unit of Médecins Sans Frontières (MSF) – UK and worked in the field in Uganda, Sudan, the Republic of Congo, Ethiopia, India, and Bangladesh. Dr. Balasegaram has clinical experience in tropical medicine, including malaria, sleeping sickness, and visceral leishmaniasis. He was the Principal Investigator at Um el Kher, one of the two Sudan sites involved in the DNDi paromomycin trial for the treatment of visceral leishmaniasis. Manica Balasegaram is currently completing a master’s degree in Public Health in Developing Countries and received a diploma in Tropical Medicine at the London School of Hygiene and Tropical Medicine. He has a background in internal/emergency medicine, having earned his bachelor of medicine/bachelor of surgery degree from Nottingham University Medical School in the UK.